Buses are all well and good but keen explore more of Kos's interior, we really needed our own set of wheels. We could have hired sport cars or soft tops but, at 38€ for the day, we were more than happy with a little red Hyundai. Repeating keep to the right, keep to the right, like some sort of religious mantra, it didn't take long for Jon to get to grips with driving on the wrong side and, with surprisingly good road surfaces, the journey was far smoother than negotiating the pot hole-riddled horrors that we're used to at home. In just over an hour - we took a couple of wrong turns and inevitably ended up lost in an olive grove - we reached our first destination, the island's most important ancient site, Asklepieion, which was founded in the 3rd century BC. 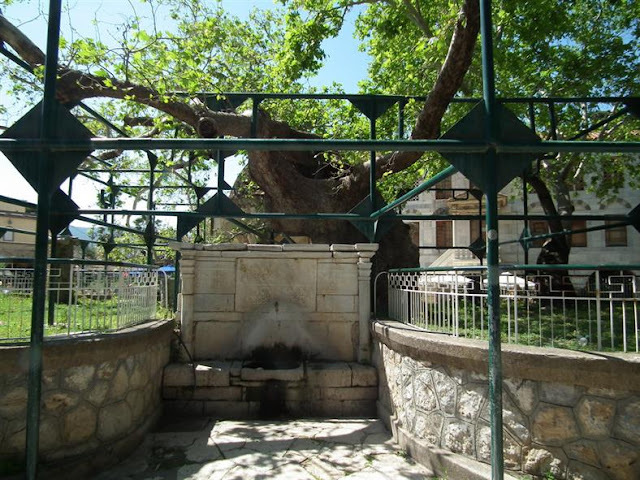 Until it was destroyed by an earthquake in 554 AD, Asklepieion had been both a school of medicine and a healing centre and followed the teachings of Hippocrates who, if you remember from my last post, was born & lived on Kos. Asklepieion was named after Asclepius, the Greek god of healing and the son of fellow Gods, Apollo and Coronis. Whilst pregnant, Coronis was unfaithful to Apollo and he was so angry that he had her burnt on a pyre but, during the cremation, he realised his error and snatched his unborn son from her womb. Apollo banished Asclepius to Earth where he was found and raised by Chiron, a kindly centaur. Chiron taught Asclepius the art of healing and he became so accomplished that he learnt the art of raising the dead and attained immortality. The ruins occupy three levels with the Roman-era public baths and remains of the guest rooms on the first level. Asklepieion has the most incredible views over the Aegean to Turkey, said to have been deliberately chosen in order to lift the spirits of the patients who travelled from all over Greece to seek treatment. The second floor holds an altar of Kyparissios Apollo, with the 1st century BC Temple to Apollo to the east and the first Temple of Asclepius, built in the 4th century BC, to the west. Are these columns Ionic, Doric or Corinthian? Judging by the ornate carving at the top they'll be Corinthian. Those seven years spent at grammar school weren't in vain after all! Making like a vestal virgin in my £1.99 charity shop cheesecloth dress. As you can see, we became mildly obsessed with photographing these lion head spouts, likely from a sophisticated two thousand year old drainage system. 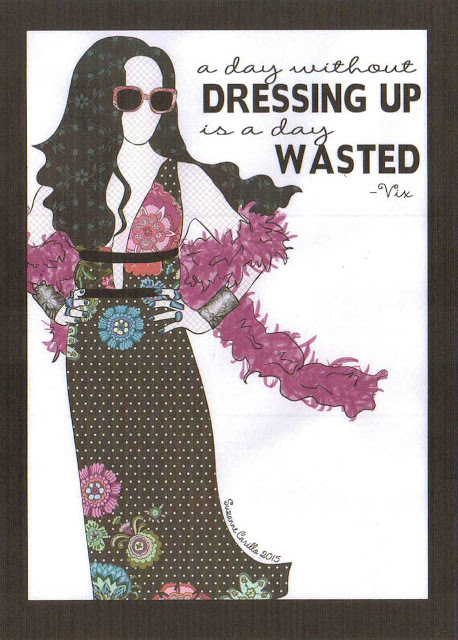 Who says you can't combine beauty with practicality? Certainly not the ancient Greeks. The other tourists that day were mostly German and Italian. There were a couple of Brits at the ticket office arguing that they weren't going to pay eight quid just to see a f*cking church. Yes folks, we're going to be forced to leave Europe soon and live on an island surrounded by people like that. God help us. My legs haven't been the same since I climbed these steps. 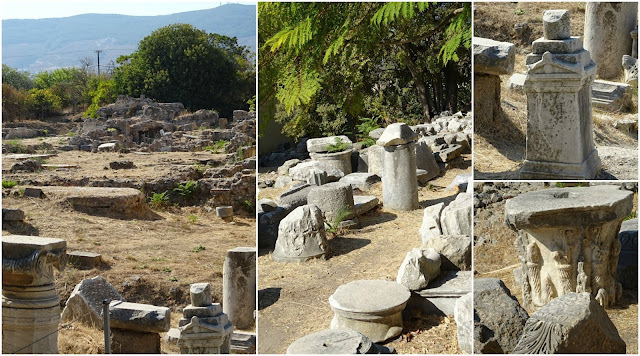 The remains of the 2nd century BC Temple of Asciepius are up on the third level. After passing the time of day with a couple of Asklepieion's resident cats we jumped back in the car and continued on our way. We drove up a perilously steep cliff to Zia, said to be Kos's prettiest mountain village. After parking the car and taking a short climb up the hill, we stopped off at a 200 year old former watermill for an iced coffee (frappe). 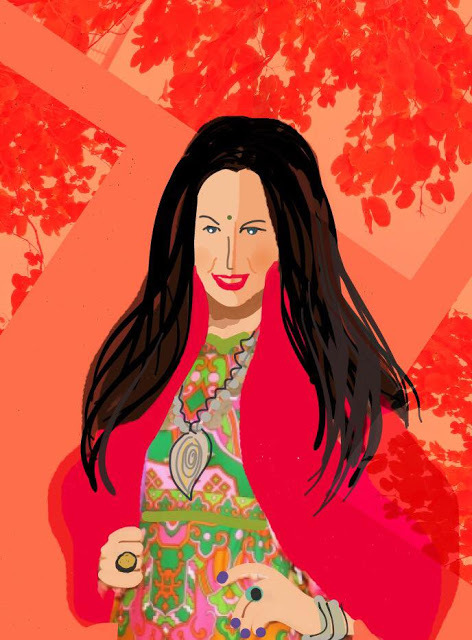 According to the Lonely Planet, Zia resembles a one street theme park in peak tourist season with coachloads of tourists deposited every few minutes. By mid-September it was pleasantly busy but not overwhelmingly so. A further few miles drive through the Dikeos mountains and we reached the village of Pyli. Pyli was far less commercialised, with just a handful of tourists seeking shelter from the blazing sunshine in the village's two tavernas, next-door to one another in a pristine village square. We took a seat, ordered (just by way of a change) Greek salads and Mythos beer and watched the village housewives scrubbing the outside of their houses whilst cats basked under the foliage. After lunch we wandered around the village and daydreamed of buying an ancient stone house, I'm rather taken with THIS one! And that was Kos, just the relaxing week away we needed - beautiful beaches, endless sunshine, fabulous food and ancient ruins on almost every corner. Batteries recharged and pre-festival season sanity restored, a mere twenty-six hours after landing back in the UK we were back on the road. 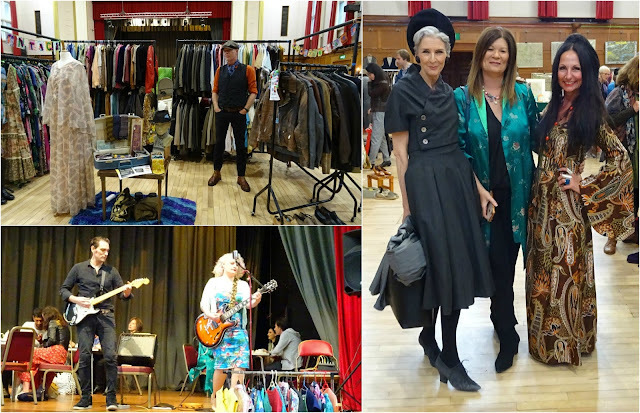 With the alarm set for 5am, last Saturday we travelled to Walthamstow where we had an amazing day trading with Pop Up Vintage. 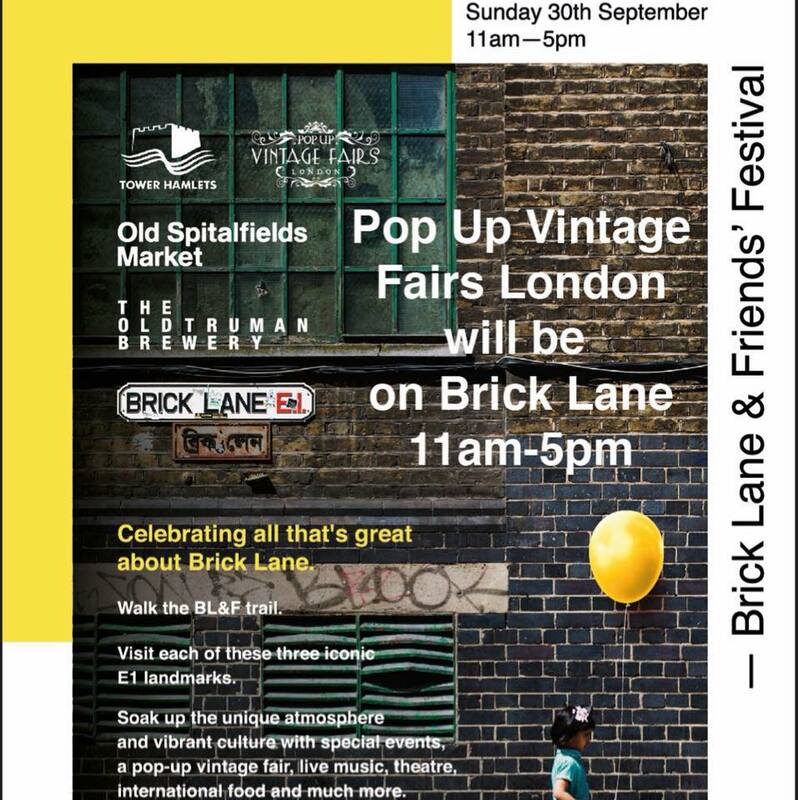 Tomorrow we're off to London again with Pop Up Vintage, where we'll be trading at the Brick Lane and Friends Festival (details HERE). 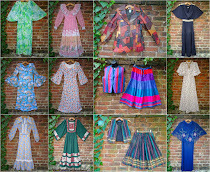 We've been out hunting every day this week and we've got some incredible new old stock, even if I do say so myself! Kos Town is the capital of Kos and, with a population of 14,750, the only sizable town on the island. Buses leave Kamari harbour every three hours and the 40 km journey takes around fifty minutes. For a couple of euros extra you can pop into the village travel agent and book a seat on one of their twice weekly coach trips which will pick you up from your accommodation (unless you're up a narrow mountain path, like us, in which case you have to wait on the sea front) and drop you off in Kos Town, collecting you four hours later. As it is approaching the end of the tourist season we shared the coach with just four other couples - a lot more spacious than the bus! You know that old Greek film Never On A Sunday? Well, if you ever visit Kos Town, you need to change that to a Monday as, once we'd stepped off the coach, we soon discovered that several of the town's main attractions were only open from Tuesday to Sunday meaning that both the Archaeological Museum and the 15th century Castle of the Knights were off the agenda. Oh well, if you've ever visited Kos then you'll know that it's an island of endless treasures and that, even in Kos Town, it's pretty much impossible not to spot an Ancient Greek ruin as they're scattered pretty much everywhere you turn. Next to the car park we came across some ancient ruins which, we discovered, were uncovered after an earthquake in 1933. The House of Europa (on the left, in the background) dates from the 2nd Century and in front there's a section of the Decumanus Maximus, the Roman city's main thoroughfare. The Medieval walls of Castle of the Knights, constructed in the 15th century, stand guard beside Kos harbour whilst the overgrown inner courtyard plays host to hundreds of cats, basking in the shade. At the port you'll see an unbroken row of excursion boats, fishing vessels and fancy yachts bobbing against each other all along the waterfront. High speed catamarans connect Kos Town with Turkey, a journey of around twenty minutes. Piatera Platanou is a pretty cobblestone square filled with grand buildings. The Greek Orthodox church still bears the scars from last year's earthquake which claimed two lives and injured over 100. Here, over an iced coffee, in one of the many shady cafes that throng the square you can pay your respects to the Hippocrates plane tree, where Hippocrates is said to have taught his pupils in its shade. The ancient sarcophagus beneath was converted into a fountain by the Ottomans while the magnificent 18th Century Mosque of Gazi Hassan Pasha, sadly now boarded up, stands opposite. A bronze statue depicting Hippocrates instructing his students with the Hippocratic oath in both English & Greek etched on to the sides. Look at the quality of the carving on that thousand year old slab of marble. It's unbelievable that pieces like that are just lying around in the town centre, isn't it? The Ancient Agora was, like the House of Europa, exposed following the 1933 earthquake. Back in the 4th century BC, this was the first town ever laid out on blocks. Lunch was taken al fresco in a tiny cobbled street running adjacent to the harbour and consisted of Greek Salad and Mythos beer....again! We couldn't resist a stroll around the shady cemetery. Here's the church of Saint John the Baptist which was built in the 5th century AD. We were happy to see that animal charity, Z.O.E.K, had collection boxes all over Kos Town with signs encouraging visitors to donate their spare change to help the strays. Volunteers ensured that there were bowls of cat biscuits and water readily available for any hungry cats. 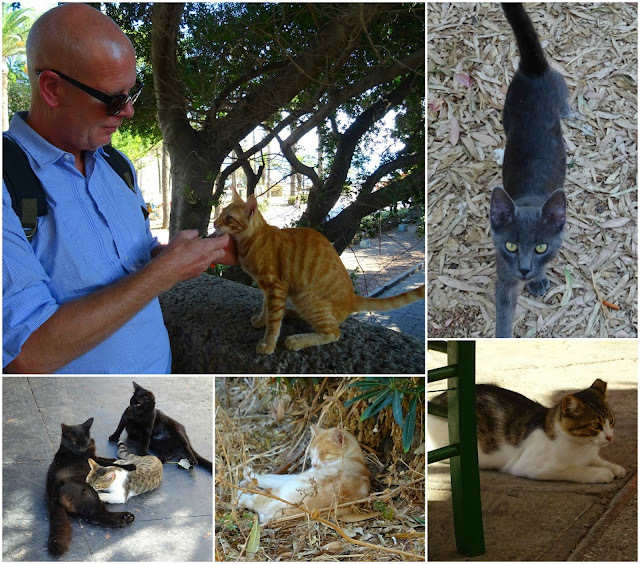 It's impossible to visit Greece and not fall in love with the cats - we always do! After a final wander around the medieval walls we strolled back to the car park to catch our coach back to Kamari. I'll be back with the final installment very soon.